Mrs. Scratchen-Post is one of the characters in the 2014 film, The LEGO Movie. 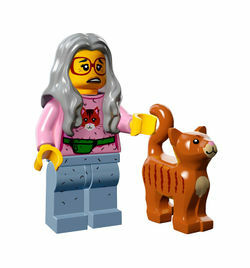 She has at least nine cats, including Fluffy, Fluffy Jr., Fluffy Sr., Jasmine, Dexter, Angie, Loki, Bad Leroy, and Jeff based of the The LEGO Movie Junior Novel. Emmet’s neighbor Mrs. Scratchen-Post takes her cats with her wherever she goes. She has so many that she can hardly keep track of them all, though that doesn’t stop her from covering all of her belongings with kitty-themed pictures and decorations. Even though Emmet knows each and every one of her cats by name, from Jasmine to Bad Leroy to Fluffy, Fluffy Jr. and Fluffy Sr., Mrs. Scratchen-Post barely pays attention to him. After all, he doesn’t even have a tail or whiskers! This page was last edited on 9 January 2016, at 22:56.